The passenger compartment remained stable in the frontal impact test. Dummy readings indicated good protection of the knees and femurs. However, the steering column was thought to pose a risk to those occupants of different sizes and to those sat in different positions, and protection of this body region was rated as adequate. The car scored maximum points in the side barrier impact, providing good protection for all body regions. In the more severe side pole test, protection of the head and pelvis was good and that of the chest and abdomen was adequate. Good protection was provided by the seat and head restraint against whiplash injuries in the event of a rear-end collision. The head of the 3 year dummy, sat in a forward facing restraint, did not move forward excessively during the frontal impact. Readings of accelerations in the dummy's chest indicated fair protection while that of the head was good. In the side impact, both dummies were properly contained within the protective shells of their restraints. The passenger airbag can be disabled to allow a rearward facing restraint to be used in that seating position. However, information provided to the driver regarding the status of the airbag was not sufficiently clear. A label on the sun visor warns clearly of the dangers of using a rearward facing restraint without first disabling the airbag. Pedestrian tests were not carried over as Euro NCAP's test methods have changed since the car was assessed in 2005. The protection offered by the bumper to pedestrians' legs was predominantly good. However, the front edge of the bonnet gave poor protection and scored no points in our tests. In most areas likely to be struck by the head of a child, the bonnet provided good levels of protection. However, in those areas likely to be struck by an adult's head, protection was predominantly poor. 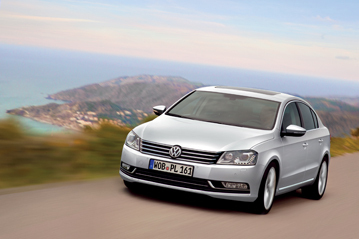 The Passat is equipped with electronic stability control as standard equipment on all variants. A seatbelt reminder is standard for the driver and front passenger seats. The Passat has been facelifted for 2010. Structurally and internally, the new car is identical to the one tested in 2005 and test results for the frontal, side barrier and side pole impacts have been carried over from that assessment. New pedestrian tests have been done as there are slight modifications to the bodywork at the front of the vehicle and because Euro NCAP’s test methods have changed since 2005. Whiplash tests have also been done to give the new car its 2010 rating.